I know this might seem to be one of those wine-geeky, meaningless technical things that “ordinary” wine drinkers don’t care about, but it is interesting and kind of important in terms of understanding how wine is rated, priced and sold. Especially if you like French wine, please read on. Chateaus in St. Emilion weren’t part of the original 1855 classification, for reasons no one seems to fully understand other than, perhaps, the haughty egos of the wine royalty at the time. I suppose that these wine barons looked down condescendingly on right bank chateaux, and probably felt that St. Emilion was a pastoral backwater even among them. An inventory of the property making up the estate, with a list of any modifications made over the last ten years; all commercial documents showing the sale price of wines produced on the property over the last ten years; and, examples of the wines produced on the property over the last ten years, the choice of vintages being left to the Committee. Then using the information above, the Committee looks at consistency in terms of the size and quality characteristics of the estate; the running of the estate with regard to vineyard practices and winemaking; marketing, presentation, reputation, promotion work and sale price; and regularity and quality of the wines, as perceived by tasting and other methods. Obviously all of this is subject to much personal interpretation and of course controversy. 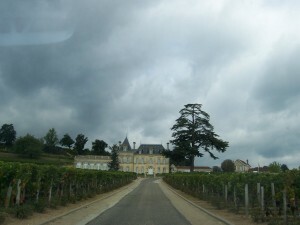 In fact, the more recent (2006) classification was suspended when some chateau owners whose wines were downgraded, sued. As far as I can tell, the ratings are still in the hands of the court. But let’s not let that stop us from discussing and enjoying these wonderful, Merlot and Cab Franc-based wines! 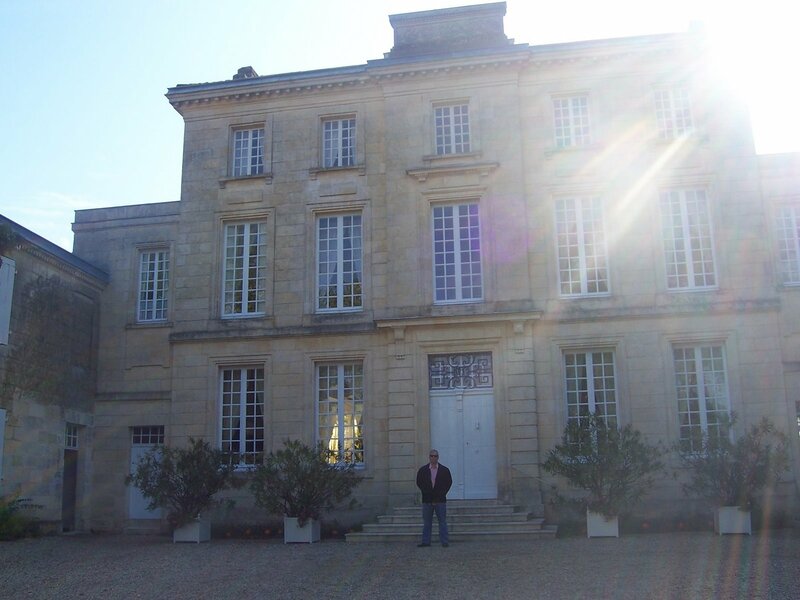 This beautiful Chateau – or more correctly, its wine – was the subject of a nasty spat a few years ago between Robert Parker and Jancis Robinson, concerning the 2003 vintage of this Merlot-based, right-bank property. Pavie is one of 13 producers classified as a Class B Premiers Grands Crus Classe, with about 91 acres (38 hectares) under cultivation in three distinct terroirs. Who Said Wine Isn’t Warfare? Although my readers know I don’t kowtow to this sort of thing – and they also know I respect Ms. Robinson immensely (she’s a great wine writer and a lot more ‘approachable’ than Parker) – I don’t agree with her on this. This, of course, is the wonderful thing about wine but it is rare to have such prominent wine writers disagree so widely and so vocally about one wine. I digress. Pavie is situated on a lovely hillside south of the village of St. Emilion, and named for the deep-pink peaches called pavies that used to grow here. 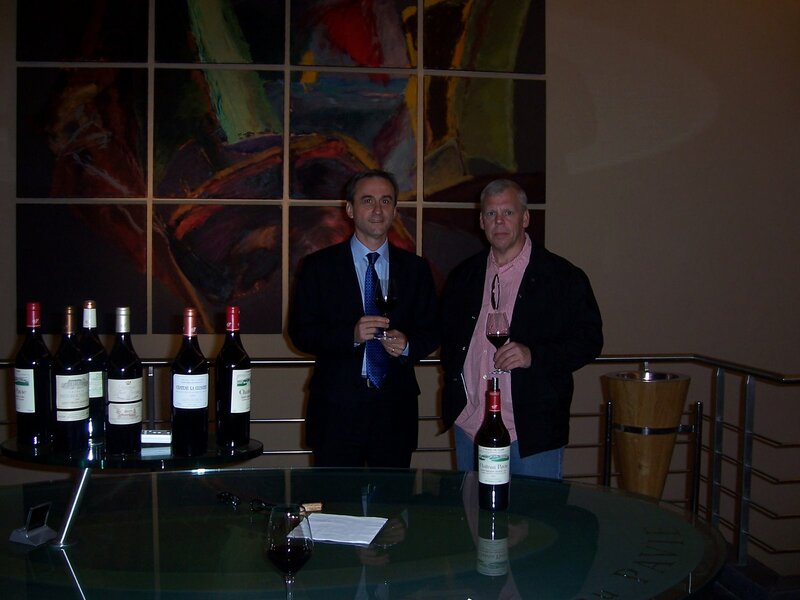 In 1998 the estate was purchased by Gerard Perse, a wealthy Paris grocery store magnate, who with his wife has sunk serious money into Pavie, continuing the work of previous owner Jean-Paul Valette. They’ve built a new winery (the old one partially collapsed) including 20 new oak fermentation tanks and a unique, air conditioned double-walled barrel room. 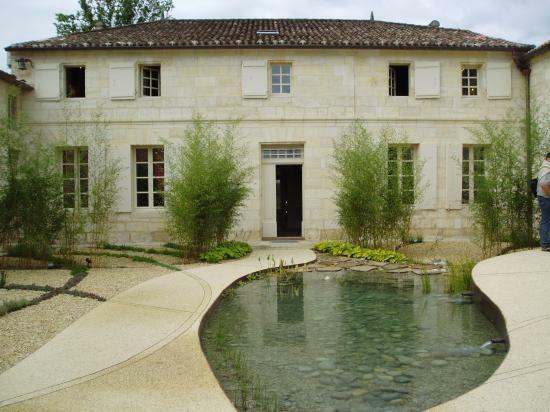 For the record, the “Couple Perse” live at Chateau Monbousquet nearby, which they bought before Pavie, and they’ve also acquired Chateau Pavie Decess and Chateau Bellevue Mondotte. Given that we showed up on the first day of the Merlot harvest, our presence itself was a bit of an imposition, and the only time we could be accommodated was at the absurdly early hour of 9:30 a.m. We were met by Monsieur Pascal Babeau, the Director of Marketing for Pavie, who walked us slowly through the winery while he explained the approach of Monsieur and Madame Perse. M. Babeau, a native of the area, returns to Bordeaux from the heart of Champagne country, where he held a similar position at Mumm in Reims. Bon chance to him in his new bucolic setting! They do some very interesting stuff at Pavie. First, they de-stem but don’t crush, then ferment fruit from each of the property’s 20 parcels in individual oak fermenters. Interestingly, and oddly in my view, they use dry ice placed directly in the tank to cool the fermenting must for about one week of the 2-week process. This contrasts with most chateaus that, although they use oak fermenters, are outfitted with coils using chilled water or some refrigerant. The Chateau Pavie first label blend is 60% Merlot, 25% Cabernet Franc and 15% Cabernet Sauvignon, and the vineyards are green harvested in June with leaf thinning in August. The wine spends 24 months in oak before bottling, 70% new and 30% one year which is the style in this part of Bordeaux…and very costly. 5,000 cases a year. Named for a Roman pro-Consul of the Figeacus family, Chateau Figeac dates back to the second century A.D. 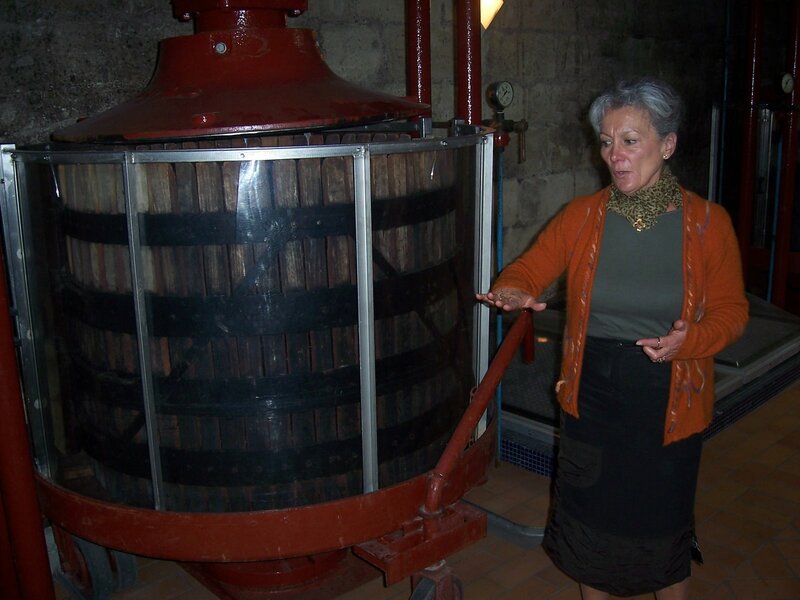 While Figeac had a checkered history with seven owners in the mid 17th century alone, it’s been in the hands of the Manoncourt family since 1892. And probably to the regret of the current owners, in 1832 the then-owners sold 15 hectares to Monsieur Laussac-Fourcaud, including some of the gravelly land that runs to and abuts the famous Chateau Petrus just over the border into the Pomerol appellation. Those 37 acres would eventually become Chateau Cheval-Blanc! 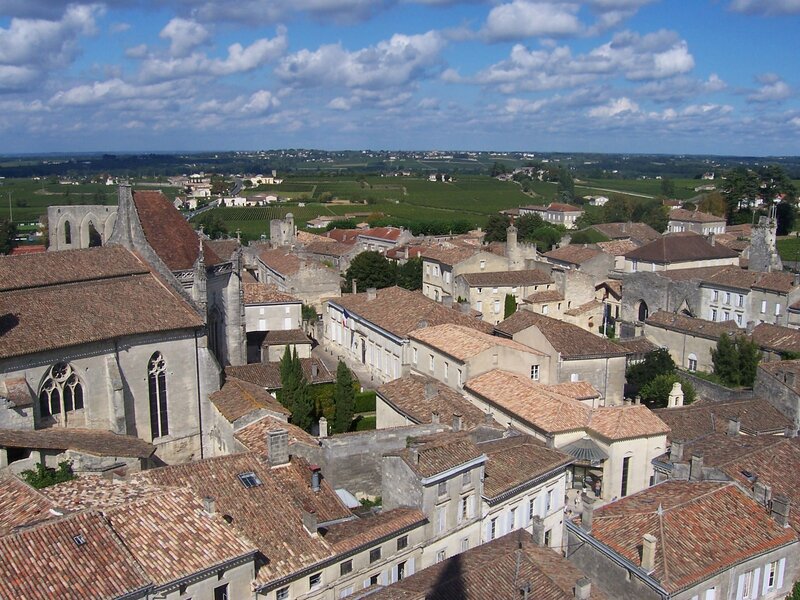 Still, Figeac is the largest property in the St. Emilion appellation, with 40 hectares under cultivation, surrounded by 32 acres of woodlands. And like Pavie it’s one of the Class B Premiers Grands Crus Classes, with only Chateau Ausone and Chateau Cheval-Blanc ranking above it. But don’t confuse Chateau Figeac with wines from ‘Chateau La Tour Figeac’, also produced in St-Emilion but only ranked Grand Cru Classe. 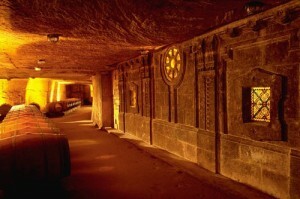 Same goes for Chateau La Tour du Pin Figeac, which lost its GCC status in the 2006 re-appraisal. When we arrived, the current patriarch Thierry Manoncourt, a spry and robust man of 90, was showing some guests around. Dapper in his cravatte and linen trousers, Thierry was clearly excited by the harvest that had begun only that morning, as you can see in the photo on the right below. 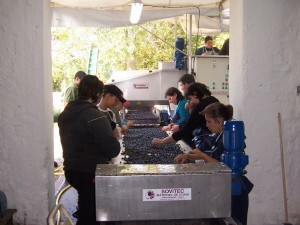 Here, a gang of day laborers is taking the fruit through a 3-stage process of de-stemming, crushing and sorting. I almost felt like an intruder as I snapped a photo while they worked. 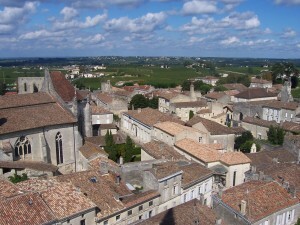 Figeac wines are distinguished across St. Emilion by their relatively large (1/3) proportion of Cabernet Sauvignon, alongside equal parts of Cab Franc and Merlot. 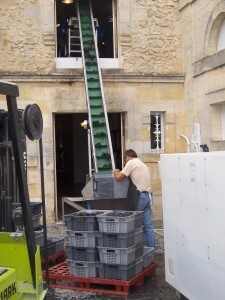 The winemaker uses what might seem to be old and antiquated basket presses, but this traditional method helps deliver just what the chateau is looking for. 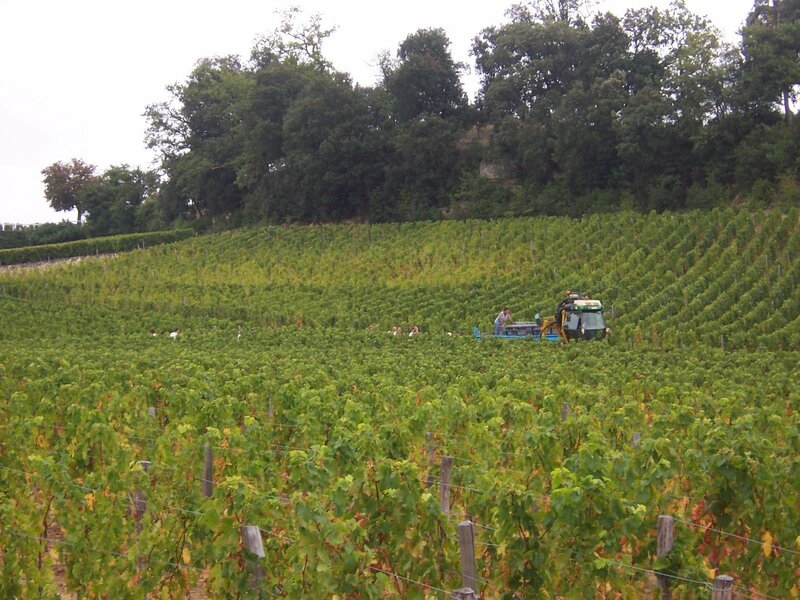 Although not among the “Premiers Grands Crus Classes A” wines, Figeac wines are among the best of the Class B’s, principally the beneficiary of the gravelly, pebbly soil that drains well and absorbs heat by day that keeps the vineyard warm at night. Of all the St. Emilion chateaux, only Cheval-Blanc has this deep gravel, which is also why Cabernet does so well here and makes up such a large proportion of Figeac wines. 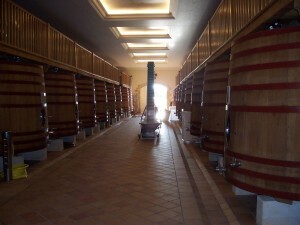 They’re aged in 100% new oak for 18 to 20 months, and amount to about 10,000 cases a year. 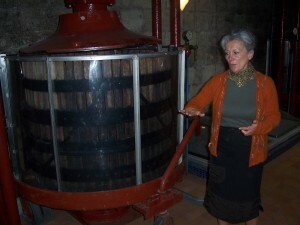 The second label, called La Grange Neuve de Figeac, is made primarily from fruit sourced from younger vines, and was the only wine produced in 1963 and 1965 here. However, I was fortunate to be able to taste the 1995 first label – a deep red wine, dense, with a slightly sweet tinge and chewy but not unpleasant tannins. And a nice long finish. Chateau Fonplegade sits a rather steep hillside, just above the Union des Producteurs de St. Emilion, the wine trade union of the appellation founded in 1884. This organization supports the area’s producers that do not own their own chateaux, and/or do not source grapes from their own vineyards. In an unfortunate way, the imposing building that is the union’s warehouse and headquarters mars an otherwise lovely view on the southwest of the village. When we arrived on the afternoon of September 24, grape harvesters and wagons were lined up for perhaps a quarter-mile along the narrow gravel road from which you enter the chateau. A light rain had just begun to fall, but there was a crew in the field and they looked nonplussed by the rain…a few of them were even singing. In line with a wave of recent purchases and consolidations in the appellation, Fonplegade was acquired in 2004 by Stephen Adams – an American magnate and Renaissance man who made his money in a wide variety of businesses: billboards, banking, and selling recreational vehicles, of all things. If his businesses were a single entity, it’s estimated that it would be about 150 on the Fortune 500. “Adams French Vineyards” as it’s called also bought Chateau De Candale, Chateau Lagarosse and Chateau Bel Air Laland Pomerol, and later Chateau L’Enclos, Pomerol and Chateau Roylland. It seems that Mr. Adams is collecting wineries just like he’s collected a variety of other enterprises. And he’s not sitting on his money, either; he’s put several million into sprucing up the chateau, buying new fermenters, an Oxoline barrel storage and racking system, and a lovely new tasting room that is reminiscent of the most elegant rooms you’ll find in Napa. Interestingly, there’s also a lot of merchandise for sale – leather folios embossed with the name of the chateau, polo shirts, logo tasting glasses, and of course the obligatory Laguiole corkscrews. Naturally, I got one of each and two tasting glasses. Fonplegade owns about 18 hectares, or 44 acres, and they make classic, Merlot-heavy right bank wine: 91% Merlot, 7% Cabernet Franc, and 2% Cabernet Sauvignon. They macerate for seven days and use both the punch-down (twice a day) and pour-over techniques, then ferment for 40 to 45 days in those new tanks. They then move the wine to 100% new oak barrels, which are frequently racked, a chore made easier with the new Oxoline system, and produce about 2200 cases at 13.5% alcohol. Their second label, Chateau Fleur de Fonplegade, takes fruit sourced from younger vines/blocs, but get precisely the same treatment, and they produce about 2450 cases. 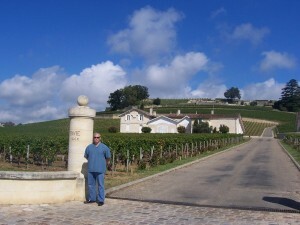 But imagine my surprise when I discover that “the” winemaker of Fonplegade is listed as…wait for it…Michel Rolland, the flying winemaker, the famous Frenchman, and the bane of a thousand winemakers who aren’t so, well, famous. One hears that Rolland is personally defining an international style and creating a legion of wines all in the “American mode” – over-oaky, overwhelmingly fruity and slightly sweet, with little nuance and no subtlety. Well, this actually explains a lot, including the oxygenation apparatus I saw, attached to one of the new oak fermenters being installed the day we visited. Chateau Franc Mayne, a beautiful place, was my least favorite visit during three days of touring and tasting in St. Emilion. I was astonished that it seemed coldly commercial in the mold of the most commercial wineries in Napa. In fact, it reminded me of Markham Vineyards north of St. Helena, where the first words out of the tasting room staff were “that will be ten dollars” and where their second concern was selling me t-shirts and ballcaps with the Markham logo. Too bad, really, in both cases. Back to the matter at hand. The winery itself is small…this is a 5000 case winery, which in the US almost qualifies as a garage winery, and at the time of our visit there was still a lot of construction going on which lent the place an unfinished and chaotic air. Currently owned by George Fucroy and Associates, about which I can find very little, Franc-Mayne was previously owned by international insurance giant AXA from 1984 to 1996, and was run during that period by Jean-Michel Cazes of Chateau Lynch-Bages. It’s interesting and ironic that during the AXA/Cazes period the reputation of Franc-Mayne’s wines took a nosedive. As for winemaking, they ferment in both oak and stainless steel here – the first label in oak only, and the second label, Les Cedres de Franc Mayne, in stainless only. It’s a strange choice in my view, although the reason given isn’t: grapes from the new vines produce juice that’s very tannic and they don’t want to accentuate that with oak. They also sometimes use cultured years, a real departure from the practice of most chateaux of St. Emilion. The first label wine is 90% Merlot and 10% Cab Franc, making this a classic rightbank blend, which then spends 15-18 months in 70% new oak. One reviewer calls the wine produced this way since 2000 “fat, rich and oaky,” and well, no wonder: our friend “the flying winemaker” Michel Rolland is the winemaker of record. With a mere 7 hectares of vineyards this is a pretty small place even by local standards, but with five acres of impressive underground quarries and caverns, it’s a local star for a different reason. We explored those caverns with our guide and that was probably the one truly unique and non-commercial part of our visit. Of course, my claustrophobia began to kick in as I realized I was underground with millions of tons of rocks just above my head, so as soon as our guide stopped talking, I headed for the salon de degustation and the reason I came. Franc Mayne wines have a reputation in general of being over the top, concentrated, overly oaky, and tannic, and sometimes, peppery. Big surprise, given the winemaker, right? Now, a lot of Americans might find that just about right, although I don’t count myself among them. Still, I tasted the Grand Cru Classe 2001 and found it nicely balanced with good fruit, fairly soft tannin and a very long finish. I contrast that with the second label Les Cedres 2002 which was “forte” – highly tannic yet also with far too much acid, peppery and leathery and a too-long overwhelming finish. Myself, I finished with a Chateau Vieux Maillet 2003 – a “sister” chateau – 80% Merlot, 20% Cabernet Franc, young and bold, bright fruit, a little leather and slightly rough but not unpleasant tannin. My take? If you’re touring St. Emilion (and you should) and you can’t get a room at the Hostellierie de Plaisance (and you should try) then stay here, at Franc Mayne. But in my view, you should visit other wineries, where you won’t be treated like a low-class tourist.